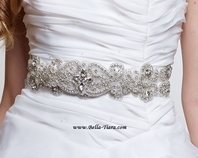 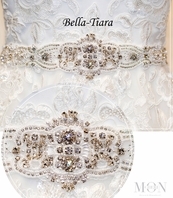 Description: Absolutely fantastic beaded luxury sash densely packed with finest crystals and pearls combined with round, tear drop and marquise crystals. 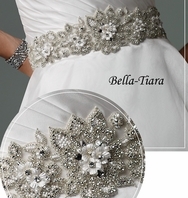 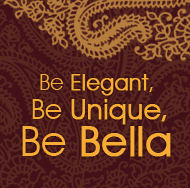 It is made in elegant vintage motif pattern that creates a gleaming brilliant sparkles. 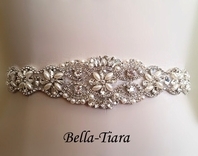 Crystal design is 18" long and 1.75 " wide. 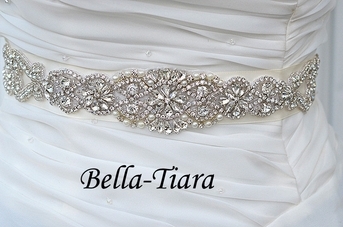 Ribbon of your choice(1.5inch wide) is sewn on the beading and ties in the back as a bow or a knot. 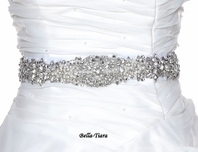 Great to sew directly on the dress(at empire waist) without using long ribbon sash.